Dual comp. sinks with hot and cold running water, Large capacity fresh & waste water tanks. 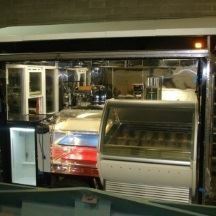 2 extra large freezers, Stainless steel working area, Chocolate syrup, Hot fudge. Cold storage toppings rail, 2 dipperwells. There’s no doubt about it – event goers love their food! From sports events to picnics to fairs and beyond, it is not uncommon to see a long line at food concession trailers of all kinds. Because of the high demand for tasty food at these kinds of events, you need a top-notch food trailer, suited for all of your cooking and vending needs! Whether you’re offering food and drink or merchandise and souvenirs, we’ve got you covered with our food concession trailers for sale. You’re sure to be the go-to for all event goers. Here at All Star Carts, providers of amazing food carts for sale and more, we’ve got a variety of food concession trailers for sale, with options for every common or the uncommon vended food and drink. From fast food such as burgers, pizza, lemonade and ice cream to hot dogs and fried oreos you’re sure to be successful when you vend with mobile concession trailers, trucks, carts, or kiosks from All Star Carts. If you’re looking for reliable mobile concession trailers or any other food carts for sale, choose All Star Carts!